It is not all singers who command the art of delivering to the listeners all the richness of the contents and emotions of the words they sing. Sometimes a singer just admires a musical phrase or tries to show the best qualities of his or her voice, its natural beauty or acquired skill. The words with this approach turn into an accessory instrument that provides the voice with necessary combinations of vowel and consonant sounds. A singer, at best, articulates the words carefully and sings the endings distinctly. The meaning of the text, in this case, recedes into the background and does not play any important role. Artists of the Bolshoi Theater understood the words and managed to bring the meaning home. Such was a century-old tradition. That was a school of the Moscow Conservatoire and the Bolshoi Theater itself. The great Shalyapin shook the Italians on their own stage in Italy by a typically Russian ability to bring home to listeners the meaning of what he was singing and to act it. Opera Mefistofele by Arrigo Boito at first was a complete failure but then a great success when interpreted to the Italian audience by a Russian singer who showed that music in singing is only a part of the art while the words were also its important component. Ivan Mikhailovich Skobtsov (1900 - 1983) was a true master of this art. His voice reproduced every tint, even most subtle, of the meaning of the text. His voice used to laugh and to cry, to grieve for somebody and to make merry, to meditate and to long for somebody. For every word there was a special colour and intonation in his singing. There are many melancholy songs on this CD. Each is sad on its own way because each tells a special story. Skobtsov does not aspire to show his voice in a most advantageous way. He does not care about it. What is important to him is the notional matter of the song. A coachman finds a girl frozen to death in the steppe. She was his only true love. His heart is broken. The voice of the singer sounds pianissimo and is full of pain that the singer played like a dramatic artist to convey it convincingly to the listeners. The skill of singing pianissimo was a great characteristic feature of many generations of the Bolshoi Theater' artists. There are so much melancholy and fondness and love and compassion and bitter memories in Skobtsov's pianissimo. There is another very special phenomenon in Skobtsov's style. When talking to his darling a lyrical hero of the song turns possibly down to whisper, Skobtsov actually does not reduces his voice to whisper but finds an intonation that makes it clear to us: that is a whisper! Skobtsov was a great master of expressive emotional singing. Both Skobtsov's colleagues in the Bolshoi Theater and music critics noted that he was singing in a most natural way like birds sing. Olga Dobrokhotova, the singer's daughter, told that in a peasant family where he was brought up every man possessed beautiful and powerful voice. But when grandfather began to sing then windows in the house trembled and the household were in a hurry to take the cat out of the house otherwise she might become deaf. Everybody used to sing in the village, the family, neighbors, and the whole neighborhood. The culture of folk singing that was inherent in Russian peasants enriched the culture of the scenic singing. 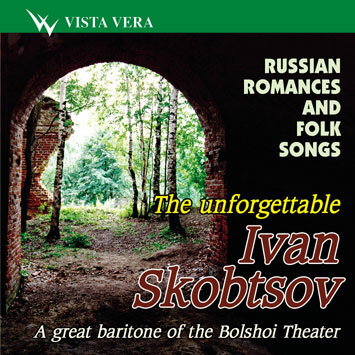 The art of Skobtsov reveals a sound and natural perception of singing as part of life where everything is sensible and interrelated. This probably explains his amazing style, his taste and a sense of adequacy and conformity. Sergei Lemeshev wrote: "I'd like to specially mention Ivan Skobtsov, my colleague in the Bolshoi Theater. I believe his talent is closely associated with the popular tradition of the folk singing and with an intimate understanding of the soul of the people". 2. Anton Rubinstein. The Turbulent Waters of Kour. From the Persian Songs. Lyrics by Mirza Shaffy, translated to Russian by Pyotr Tchaikovsky. 10. Amidst the High Corns. Russian folk song. Lyrics by Nikolai Nekrasov. Recorded: 1950 (9, 15); 1952 (5, 7); 1957 (1 - 4, 8); 1964 (13); 1965 (6, 10, 11); 1968 (12); 1970 (14).